Eastern Mennonite’s basketball women couldn’t shake host Bridgewater College for 33:40 Wednesday night. But the Royals took control over the final 6:20, outscoring the Eagles 20-9 down the stretch to secure an 83-73 decision, their fifth straight win over their rivals. The non-stop first half was played to EMU’s tempo and they led most of the way. However, the Eagles kept pace by hitting 7-of-14 three pointers. The Royals used nine offensive rebounds in the frame to lead 41-37 at halftime. The women had to lead up to as many as seven early in the second before BC came storming back. Holly Morgan’s fifth triple of the game tied the score at 58-58 with 10:41 to go. Steph Rheinheimer (Manheim, Pa./Lancaster Mennonite) answered with a long ball to put EMU back up by three, but the Eagles kept charging and finally took a 64-63 lead with 6:30 left. The Royals answered quickly with back-to-back buckets, triggering an 8-0 run to re-take the lead at 71-64 and forcing a BC timeout with 4:53 to play. Another free throw and the women had the lead up to eight points at 72-64. The defense held the Eagles scoreless for a key stretch of 3:51 to get some breathing room. BC then scraped back within five points with two minutes to play before the home team was forced to foul. Eastern Mennonite made eight straight free throws to balloon the lead to the biggest of the night at 83-71. BC got a late bucket to provide the final 10-point margin. The Royals out-shot their hosts 48% to 43%, and dominated the boards, 43-30. The women also grabbed 13 offensive rebounds. The free throw line was also a difference-maker, where EMU went 19-26, compared to just 8-9 for the Eagles. Bianca Ygarza (Conestoga, Pa./Penn Manor) proved her All-ODAC status by stepping up her play in the rivalry game. She had game highs of 23 points, eight rebounds and three steals. The power forward also dished out four assists. 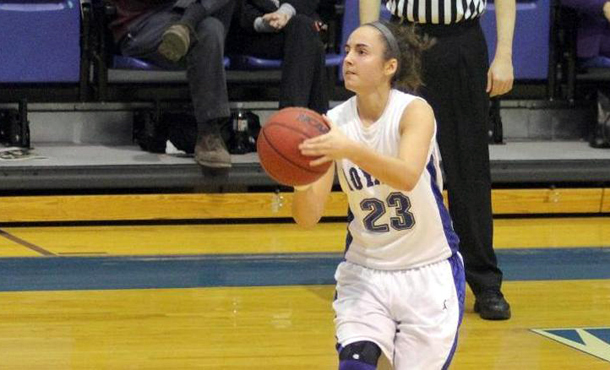 Jess Rheinheimer (Manheim, Pa./Lancaster Mennonite) chipped in 13 points and seven rebounds. Steph Rheinheimer canned three triples and finished with 11. Shakeerah Sykes (Dumfries, Va./Forest Park) added 10 points. Keyla Baltimore (Bristow, Va./Brentsville District) had a game high five assists and Alisa Brown (Dumfries, Va./Forest Park) had three steals. Morgan finished 6-for-12 from outside and led Bridgewater with 20 points and four assists. Cassidy Burkholder added 16 counters. The Royals have now won three in a row to improve to 12-4 overall and 6-1 in the ODAC. They enter a huge two-game home stand, welcoming two of the ODAC’s other top teams into Yoder Arena. That stretch starts with Guilford College this Saturday at 2:00pm. The Quakers have won the last two ODAC Championships. Randolph-Macon visits next Tuesday.